TRAFFIC IS SET to close on an Antrim road, made famous by hit TV show Game of Thrones. The tunnel of beech trees – known as the Dark Hedges – is located on the Bregagh Road, near Armoy. It was featured in the opening episode of the second series, when young heroine Arya Stark escapes the city of King’s Landing disguised as a boy. The site is one of the areas in Northern Ireland attracting major international tourist attention due to the filming of the show there. An order from Stormont’s Department for Infrastructure, however, will see a ban on cars to protect the trees from damage due to the high volume of traffic that has passed through it in recent years. Buses and coaches will also not be able to use the road. There are a few exceptions for emergency vehicles and agricultural ones in “certain circumstances”. Anyone who flouts the law will face a £1,000 fine. Conservations have bemoaned the heavy use of the road. The group NI Greenways said that it was a “national disgrace slowly killing a national treasure”. In January 2016, Storm Gertrude ripped up two trees with high winds, causing them to collapse, BBC reported. Later that year, a large rotten branch fell from one of the trees onto the road. The Department of Infrastructure said that the ban was being implemented after appropriate consultation with all relevant parties and the general public. 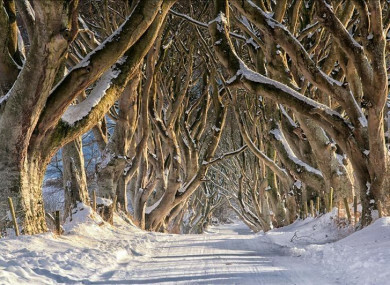 Email “Traffic banned from iconic 'Game of Thrones' road in Antrim”. Feedback on “Traffic banned from iconic 'Game of Thrones' road in Antrim”.